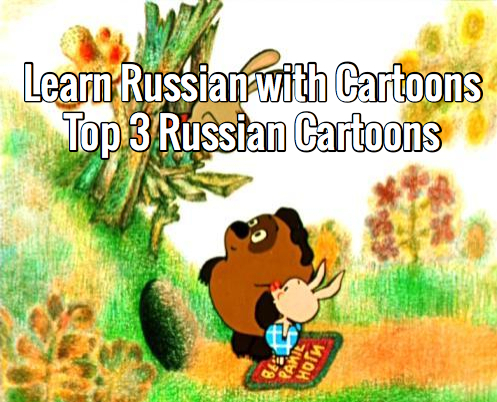 July 5, 2014 by The Junkie 0 comments on "Learn Russian with Cartoons: Top 3 Russian Cartoons for Beginners"
You know, learning Russian and overlooking Russian cartoons should be a deadly sin. Old soviet cartoons, while lacking in animation skills, make up for in depth and are loved by all Russians. If you’re learning the language, you need to check them out. You get Russian listening comprehension practice in. You may pick up on new words, phrases, etc. You’re exposed to native Russian speaking. It’s easy. Cartoons are made for kids, so they’ll be a good resource use as a beginner or intermediate learner. You get a dose of culture. Every Russian native knows and loves these cartoons. Okay, let’s get to it. What are the best and most popular Russian cartoons? Well, I’m biased. Here’s my top 3 list. Some say he’s the smarter, more intellectual version, when compared to the Western Winnie. However, in Western Winnie’s defense, Disney dumbed him down. The original Winnie, created by Alan Alexander Milne, is zen/Taoist as hell. But, I’m straying from the topic. The Soviet Winnie is talkative, rambunctious, clever, with a side of adorable Russian obnoxiousness for the sake of getting some honey. In the episode below, he goes visiting. Why? Because when you visit someone, they’re likely to treat you to something, something like honey! If that’s not a devious little Bear, I don’t know what it is. Check out “Winnie Pooh Goes Visiting (Vinni Puh Idet v Gosti)” below. It has subtitles so you can follow along. 2) Just You Wait! – “Nu, Pogodi!” – Ну, погоди! Nu, pogodi is the Soviet Union’s answer to Tom and Jerry. But, instead of a cat chasing a mouse, it’s a wolf (Волк or Volk in Russian) chasing the rabbit (Заяц or Zayats in Russian). And it’s a wolf that’s very much addicted to cigarettes. That’s very much a big hooligan. The wolf will yell “Ну, Заяц, погоди!” just as the rabbit finally gets away. You won’t really need subtitles for this cartoon. Well, this one isn’t really Russian. It’s a popular Swedish story that found success in the Soviet Union. What’s it about? Well, there’s a kid, Malish (or Малыш) – meaning Junior – that just wants a damn dog because he’s lonely. Lots of conversations and witty use of Russian language in this one, so this will be useful for Russian learners. Subtitles are available in the video below. Remember, watching cartoons is passive learning unless you’re sitting there with a pen, paper, dictionary and pause every minute to understand everything. At the least, your ear will get used to Russian language. Such is passive learning. At the most, you’ll pick up new words and perhaps begin to understand the dialog. However, cartoons are fun, easy to understand, and a good resource to use for your downtime when you don’t want to actively put crap in your brain. Have you watched any other awesome cartoons the sake of learning and or fun? Leave a comment below!